My attempts at losing weight are primarily undermined by my liking for cheese. Not that beer and rice and potatoes don’t contribute, but the connection with cheese is – for me – pronounced and immediate. 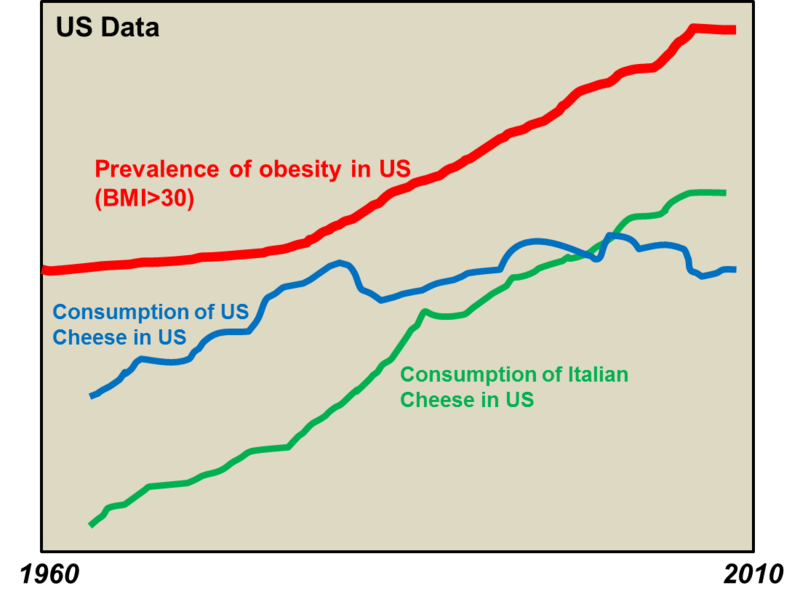 So I looked at some data on cheese consumption and obesity data for the US which is readily available. A similarity of shape between growth of obesity prevalence and cheese consumption is apparent. But the similarity is much more pronounced with the consumption of Italian rather than the total amount of cheese or just American cheese …….. Idiot research to show that global warming can be solved by cutting obesity! That researchers need to use “fashionable” catch phrases to ensure funding is not uncommon. That “global warming” is one such catch phrase which has been exploited by a variety of disciplines to justify the most inane work which has then been passed off as cutting-edge research is not new. It has been particularly evident for the last 15 years or so. Linking any research project in any discipline to “global warming” has increased the probability of getting funded. Linking obesity via human respiration to global warming is one such example of trivialising the already trivial. Even IF global warming is a problem (which I doubt) and IF carbon dioxide emissions are a cause (which is unlikely) and IF human production of carbon dioxide is significant (which it is not) and IF human respiration produces sufficient carbon dioxide to matter (and it is hardly measurable) and IF general obesity in the human population increases the total of vegetable and animal matter on the planet (which it does not), THEN this so-called research would come up to the level of being just silly. As such it is just high quality, idiot-research. The latest nonsense is from the Robert Gordon University in Scotland. But the International Journal of Obesity will not gain much in reputation by publishing such drivel. But even such nonsense – which is not new – can still capture headlines. 2008: Obesity as a cause of global warming? Here come the health-fascists – now an obesity tax!! The world is full of “do-gooders” who in the name of the good of the majority indulge in introducing new and wonderful ways of oppressing the minority. The environmental and health fascists who use coercive means – usually taxes and the banning of substances and even the behaviour of others – have converted the oppression of those who don’t think as they do into a fine art. The two latest health-fascists are members of a so-called expert group, Dan Andersson and Anna Fransson who want to tax people for being fat – for their own good and the good of society of course. And to rub salt into the wound, tax-payer’s money is used to generate this rubbish. They estimate that the cost to the public sector, in terms of healthcare and social insurance due to obesity was 15 billion kronor in 2003, a figure that could rise by between 40 and about 80 percent by 2020, according to the report. The authors consider that there are good reasons for the government to do something about the weight trap. “Fat taxes” could be invested in, for example, bike lanes and general public health surveys of adults. Health costs could be minimised further by introducing a birth tax and perhaps with the tax increasing for every year of survival. This could even encourage people to commit suicide once they retire and their economic burden becomes too heavy – for the good of the majority of course. It would solve the pensions problem and the ageing problem as well. Perhaps it is time to introduce legislation prohibiting the fascism of “do-gooders” and banning all expert groups.